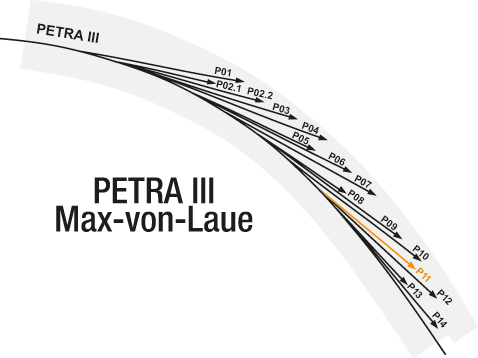 The location of P11 in the Max-von-Laue Experimental Hall is marked in orange. 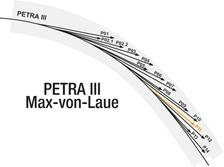 The Bio-imaging and diffraction beamline P11 at PETRA III is dedicated to imaging and diffraction experiments of biological samples. 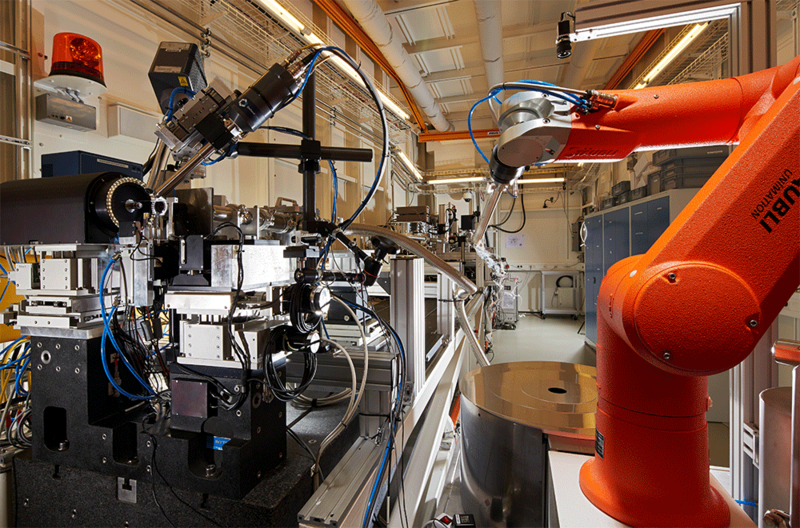 The basic idea for the beamline design is to provide an extremely stable and flexible setup ideally suited for micro- and nano-beam applications. The beamline provides two different endstations: A crystallography experiment operated between 5.5 and 30 keV and an X-ray microscope which is currently under construction and will be operated in-vacuum utilizing tender X-rays between 2.4 and 10 keV. The P11 X-ray optics consist of a LN2 cooled double crystal monochromator and two horizontal deflecting and one vertical deflecting X-ray mirror. All three mirrors are dynamically bendable and are used to generate an intermediate focus at 65 m from the source with a size of 16 x 96 µm rms (v x h) and a divergence of 8 x 15 μrad rms (v x h). For the design of the beamline optics special care was taken to preserve the coherence properties of the beam and to deliver most of the photons from the source into a very small focal spot at the sample position. Key element of the experimental hutch is an 8 meter long granite block with a weight of 10 tons, carrying the two experiments. The secondary source is physically located on top of the granite. A Scanning Transmission X-ray microscope (STXM) will allow structural investigations of aperiodic objects such as single cells and also small tissue sections. The crystallography endstation will provide beamsizes down to 1 µm with a photon flux of 1012 ph/s for the investigation of micro crystals. The experiment is equipped with a Pilatus 6M detector and an automatic sample changer.